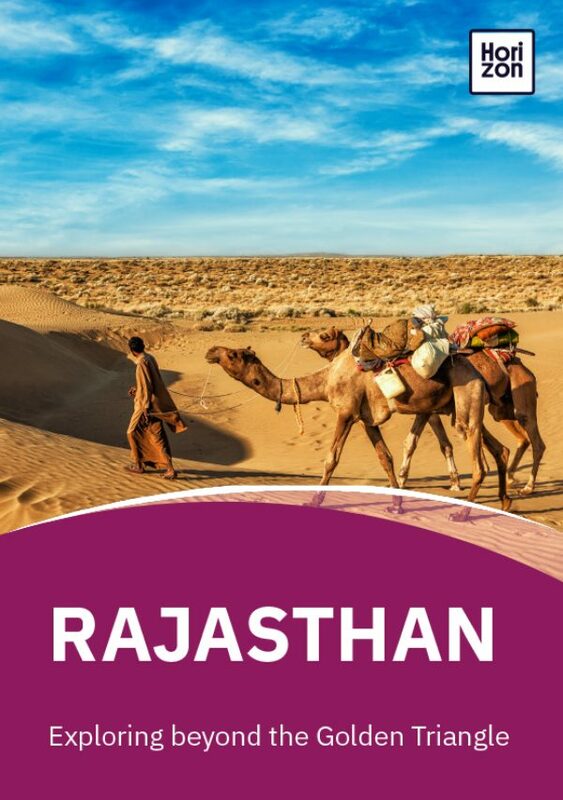 Rajasthan’s rugged, dry terrain is dominated by desert. However, pockets of jungle and fauna exist in its national parks, two of which are home to the seldom spotted tiger. Located in the heart of Sawai Madhopur district, Ranthambore National Park is a tiger reserve and former hunting ground of maharajas. A couple of hours drive from Jaipur, it’s home to just under 100 Bengal tigers, as well as leopards, crocodiles, sloth bears and hyenas. It also includes the neighbouring Sawai Mansingh and the Keladevi sanctuaries. Spread over 400 square km, the wildlife reserve is a combination of dry deciduous forests and open grasslands with more than 500 species of plants. Ranthambore is one of the most important tiger sanctuaries in India, but the tiger population has reduced due to poaching. However, this is still the best place to spot tigers in India. Make sure you use a reputable guide and respect the animals if you choose to go on safari. You’ll be able to choose from either a canter truck which sits 20, or a more personalised jeep which sits six. As well as tigers, the park is home to leopards, wild boars, wild dogs, hyenas, wild cats, sambar and chital deer, sloth bears and crocodiles among other wildlife. Look out for the giant banyan tree near Jogi Mahal -- this gigantic banyan is thought to be the second largest in India and more than 200 years old. Ranthambore is named after the towering Ranthambore Fort which was built in the 10th century. It stands 700ft tall, with three temples dedicated to Shiva, Ganesh and Ramlalji. There is a colourful Ganesh Chaturthi Fair which is celebrated in the fort’s temple during August/September every year. Look for the ancient Jain temples built in the 12th-13th centuries, the 32-pillared cenotaph and an old mansion called Sameton Ki Haveli. Sariska National Park is a tiger reserve nestled in the heart of the Aravalli Mountains. Spread over 866 square km, Sariska’s landscape is a combination of thorny scrub forests and rocky landscapes. Sariska has lost many tigers to poaching over the years. In the last decade, the park has introduced new cubs to the reserve which have successfully integrated into the environment, giving hope that Sariska’s tiger population can grow again. Besides tigers, the park is home to leopards, wild boars, wild dogs, hyenas, wild cats and many deer. You can also see crocodiles in Siliserh Lake. The park is also rich in birdlife, with plenty of peacocks, crested serpent eagles, vultures and the Indian eagle owl. Sariska was a hunting lodge of the Maharajas of Alwar and it became a wildlife reserve in 1955. It was part of Project Tiger (a conservation programme launched by the Government of India in 1973 to protect the Bengal tiger from extinction), becoming a national park in 1990. In recent years, the park’s tiger population has struggled. In 2004, Sariska was found to have no tigers left, leading Rajasthan’s local government to introduce three tigers from Ranthambore in 2005. Controversially, the government also relocated two villages said to encroach on the habitat of the tigers. As of 2018, there are believed to be 18 tigers resident in Sariska. Sariska is located close to Jaipur at 122km and Delhi at 200km away, which are the closest airports. You can hire a taxi and drive to Alwar and Sariska. The entry fee for a safari cost R470 per person and R400 for video camera. The best time to visit is October to March if you want to avoid the heat. Previously known as Bharatpur Bird Sanctuary, the Keoladeo Ghana National Park is located in Bharatpur and is almost equidistant from both Delhi (180km) and Jaipur (178km). A UNESCO World Heritage site, Keoladeo is a birdwatcher’s dream and is home to more than 370 different species of bird. Of these, approximately 230 are resident in the park, with the rest migratory. Known locally as Ghana, Keoladeo is a man-made wetland spread over 30 square km. Created by Maharaj Suraj Mal more than 250 years ago, the park was previously a hunting ground for kings and was used as a duck shoot during British rule. Visitors come to see painted storks, cormorants, cranes and several species of eagle. While in the area, visit Lohagarh Fort, which contains palaces, museums and cultural artefacts.